I’ve reviewed a lot of portable speakers for different price ranges, and it is easy to realize that people are more interested in affordable speakers. The truth is that people have to pay at least $500 for a recently released smartphone, therefore, it is very difficult to convince them to pay more hundreds of bucks for a portable speaker. Most of them will ignore expensive portable speakers and opt to purchase a cheaper one. The cost of around $50 will be ideal for them. 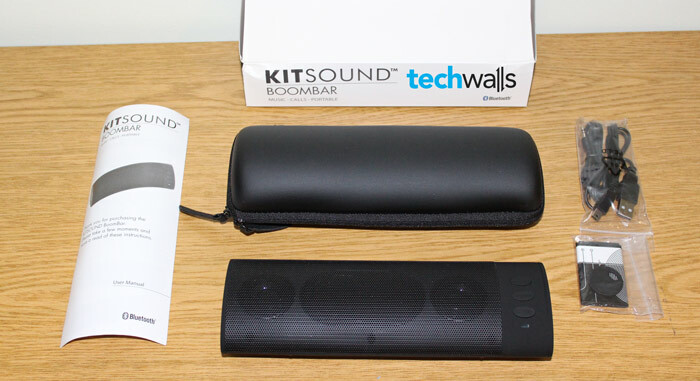 Today, I will review another portable Bluetooth speaker, that is KitSound BoomBar. This is not the best one but absolutely the lowest priced speaker we have ever tested. Let’s check out the speaker to see if its quality is compromised to cut price. The KitSound BoomBar has a quite stylish design. 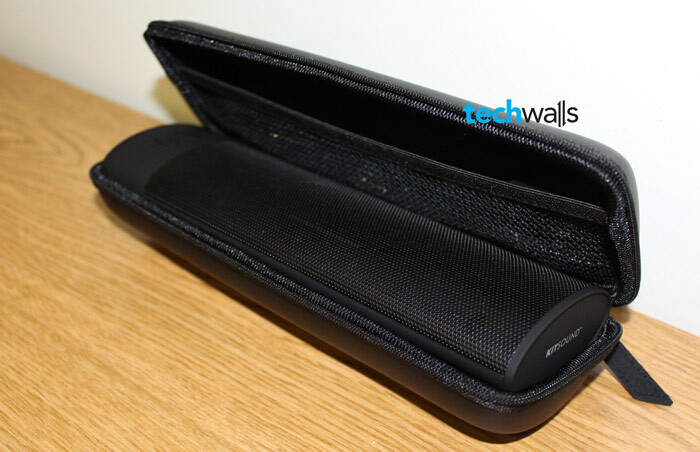 It comes in box with some useful accessories like a carry case, USB cable, 3.5mm AUX cable, removable battery and a coin stand. Notice that the power adapter is not included in box. The speaker has a pretty neat design and very lightweight to hold in your hand. The black and soft-touch finish make it very comfortable to carry around and also elegant to fit your decoration. Besides, I’m a little surprised as it comes with a protective case. The case looks quite good and it will be more convenient to carry the speaker and its accessories. It is easy to control the speaker with power button and connection ports on the right, and skip, volume buttons right on the front. There is nothing much to say about sound quality of the BoomBar. It produces a loud enough sound for your room, however, the bass and treble sounds are quite weak. So, I can’t really enjoy music on this speaker. This is understandable because it features only 2 drivers with 2W each (similar to the original AUVIO portable speaker). See the video below to see it sound quality. Remember that the sound in the video can’t be reproduced accurately. The BoomBar is powered by a 3.7V – 1000mAh battery and you can fully charge it within 4 hours. As the power adapter is not included, you can charge the battery by plugging it into your computer or using any USB power adapter for your phone. The speaker can also be used as a speakerphone as it includes a microphone on the right side. Just click on the Play/Pause button to receive incoming calls. I had some troubles when trying to pair the speaker to my phone. My phone couldn’t detect the Bluetooth device until I followed manual to press Play/Pause button before pairing. Sound is weak and broken at max volume. The KitSound BoomBar is currently listed on MobileFun’s iPhone 5S speakers for $32, . Although the sound quality is not impressive, it is absolutely still better than your phone, tablet or laptop’s speakers. I will recommend this one to low-budget consumers. Nicely reviewed, Tuan. Kind of a good portable speaker for your daily purposes, but not really good for high end users. The sound quality looks to be not-so-good.